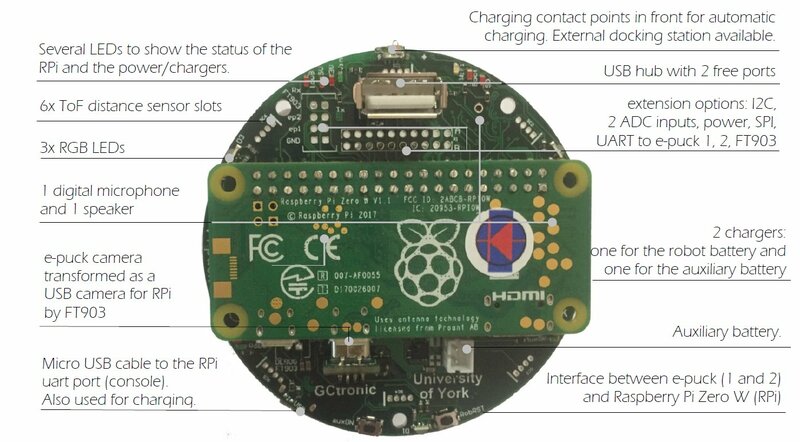 This introductory section explains the minimal procedures needed to work with the Raspberry Pi Zero W mounted on the Pi-puck extension board and gives a general overview of the available basic demos and scripts shipped with the system flashed on the micro SD. More advanced demos are described in the following separate sections (e.g. ROS), but the steps documented here are fundamental, so be sure to fully understand them. The extension is mostly an interface between the e-puck robot and the Raspberry Pi, so you can exploit the computational power of a Linux machine to extend the robot capabilities. In most cases, the Pi-puck extension will be attached to the robot, but it's interesting to note that it can be used also alone when the interaction with the robot isn't required. The following sections assume the full configuration (robot + extension), unless otherwise stated. The robot must be programmed with a special firmware in order to communicate via I2C bus with the Raspberry Pi mounted on the Pi-puck extension. The same I2C bus is shared by all the devices (camera, IMU, distance sensor, others extensions), the main microcontroller and the Raspberry Pi. Since the Raspberry Pi acts as I2C master, these devices will not be anymore reachable directly from the robot main microcontroller that will act instead as I2C slave. The e-puck2 robot must be programmed with the following firmware e-puck2_main-processor_gumstix.elf and the selector must be placed in position 10. The Pi-puck extension board comes with a pre-configured system ready to run without any additional configuration. An example showing how to exchange data between the robot and the Pi-puck extension is available in the system in the directory /home/pi/i2c_e-puck2.zip. Unzip the example by issueing unzip i2c_e-puck2.zip and then build it with the command gcc i2c_e-puck2.c -o i2c_e-puck2. Now you can run the program by issueing ./i2c_e-puck2; this demo will print the sensors data on the terminal and send some commands to the robot at 2 Hz. The code is also available from i2c_e-puck2.zip. An example showing how to read data from the IMU is called i2c_mpu9250 and can be found in the directory /home/pi/i2c_mpu9250/. Simply run the program by issueing ./i2c_mpu9250 and then choose whether to get data from the accelerometer or gyroscope; this demo will print the sensors data on the terminal. The code is also available from i2c_mpu9250.zip (to build it use the command gcc i2c_mpu9250.c -o i2c_mpu9250). Remember to follow the steps in the section System: Startup configuration if not already done. The robot camera is connected to the Pi-puck extension as a USB camera, so you can access it very easily. Use aplay to play wav files and mplayer to play mp3 files. Specify your network configuration in the file /etc/wpa_supplicant/wpa_supplicant-wlan0.conf. You can have more than one network parameter to support more networks. The system is based on Raspbian Stretch and can be downloaded from the following link gctronic-stretch-ros-kinetic-opencv3.4.1.img.tar.gz. The system starts in console mode, to switch to desktop (LXDE) mode issue the command startx. 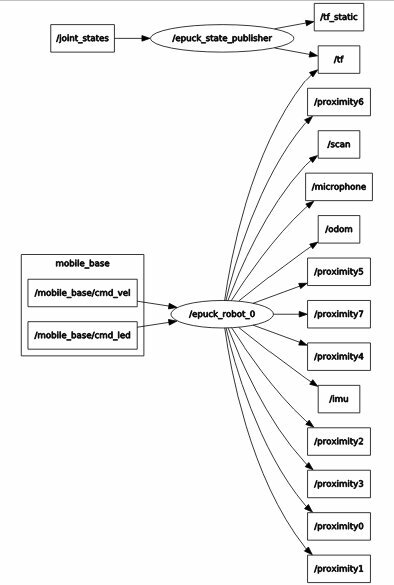 ROS Kinetic is integrated in the Pi-puck system. Remember to follow the steps in the section Requirements , only once. Remember to follow the steps in the section System: Startup configuration, each time the system is powered on. The PC (if used) and the Pi-puck extension are supposed to be configured in the same network. roscore can be launched either from the PC or directly from the Pi-puck. Then start roscore by issueing roscore. where pipuck-ip is the IP of the Pi-puck extension and roscore-ip is the IP of the machine that runs roscore (can be the same IP if roscore runs directly on the Pi-puck). OpenCV 3.4.1 is integrated in the Pi-puck system. This page was last edited on 17 April 2019, at 13:35.